A hearty and warm salad, this kale and quinoa salad with maple Dijon grilled chicken will remind you that salads really can make for filling dinners! You know that feeling you get when you’re eating a meal you didn’t think you’d like? How about that feeling when you’re shoveling said meal into your mouth with nary a breath taken? Yup. That’s this kale and quinoa salad with maple Dijon grilled chicken. I would have totally passed over this kale and quinoa salad had it not been for the wide-eyed urging of my friend, Joan, over a recent New Haven Restaurant Week lunch we had of moules frîtes and a salted caramel brownie topped with a scoop of vanilla at Cask Republic. It was quite the lunch that day and this was quite the meal as well. I decided to round out the salad with some maple Dijon grilled chicken that I let soak in my newest favorite dressing all day long and then I drizzled the salad with some of the dressing too. I really really love that dressing, can you tell? But it wasn’t really the dressing or the chicken that made this meal (though, omg the chicken! soooo tender!!). It was the barely warm quinoa that just slightly wilted the kale and soaked up the dressing that really made the salad so spectacular. This kale and quinoa salad with maple Dijon grilled chicken came together in under 20 minutes and for a healthy weeknight meal, this one felt pretty special! This is a hearty salad even without the chicken so if you’re looking for a meatless meal, feel free to skip the chicken. Alternatively, you could marinate shrimp in the vinaigrette for 15 minutes and then grill it for 4-5 minutes before tossing a few on top of each salad. Place the chicken in a large zip-top bag and pour half of the vinaigrette over the chicken, massaging the chicken to coat it with the vinaigrette. Refrigerate the remaining vinaigrette. Seal the bag and refrigerate for 8-10 hours, flipping once or twice. Bring the quinoa and broth to a boil in a small saucepan over high heat. Stir once, and reduce the heat to a simmer. Cook for 15 minutes or until all of the water has evaporated. Fluff the quinoa with a fork and dump it out on to a large dinner plate, spreading it out over the plate so it cools a little. Meanwhile, oil the grates of a gas grill and heat the grill to high. Grill the chicken (without the marinade) until the internal temperature reaches 165° F, about 3-4 minutes per side. Transfer the chicken to a plate and cover with foil for 5 minutes. In a large bowl, stir the kale and just slightly warm quinoa together. 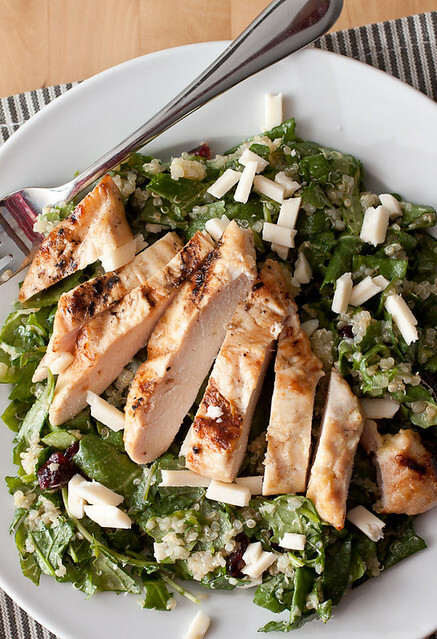 Divide the salad between 4 serving dishes, drizzle some of the leftover vinaigrette over the salad, and top with some dried cranberries, Asiago, and sliced chicken. Serve immediately. Leftover vinaigrette can be stored for a few weeks in the fridge. I enjoy chicken and kale, but I’ll be honest, I’ve never really eaten quinoa before. I hear it’s very tasty. I’m always game to try different and new to me foods. I just hope hubby will jump into quinoa with me, he’s not so much into new foods at all. His basic foods are burgers and pizza, which I also like, but NOT all of the time! LOL!! I think this would be a great first step into quinoa since it’s mixed in with the kale and the dressing. (I can’t say enough good things about the dressing!) It’s definitely worth a shot to have your hubby try it – who knows? At the very least, I’m sure he’ll love the chicken! Please let me know how it goes for both of you! I saved that dressing when you posted it, and now I want to make it even more! It’s going on the menu this week, for sure.